Last week, after a long silence, David Miliband and Bernard Kouchner, former Foreign Ministers of the United Kingdom and France, weighed in again to attack Sri Lanka. They had last hunted together in April 2009 when they came to Sri Lanka to try to save the terrorist Tigers from defeat at the hands of Sri Lankan forces. Why did they do this? With regard to David Miliband, Wikileaks made it clear that he was doing this for electoral purposes. The explanation given to the Americans for his keeness was that ‘with UK elections on the horizon and many families living in Labour constituencies with slim majorities, the government is paying particular attention to Sri Lanka’. In short, Mr Miliband was willing, in order to enhance his own political prospects, to stop Sri Lanka overcoming the terrorist forces that had caused such suffering in the country, and in India too, over such a long period. Bernard Kouchner was probably not so cynical. Certainly he made a better impression in Sri Lanka, where he seemed much more polite, unlike the bumptious Miliband. 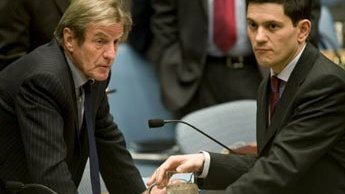 In fact Kouchner is later reported to have admitted to his envoys in Sri Lanka that he had been wrong about the situation. They indeed had reported more objectively, and the Ambassador at the time – who was honest enough to admit, after he got to Sri Lanka, that he had not known before that it was the Sri Lankan state that had funded all services in Tiger controlled areas – was refused an extension for his honesty. 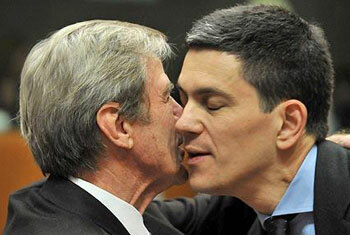 Kouchner is later reported to have admitted to his envoys in Sri Lanka that he had been wrong about the situation. But Kouchner , though a shrewd operator, did have the excuse of being an amateur and an idealist of sorts. And one can forgive the French their ignorance about Sri Lanka – as with another fish out of water, a Junior Minister who also had to be dismissed soon enough, who solemnly asked us if we had stopped using child soldiers. She clearly did not know the difference between the government and the Tigers, and more obviously she did not care. The British however had no excuse for their monumental hypocrisy and lies. Thus Miliband, along with Kouchner, now claim that they came to Sri Lanka ‘to draw attention to the human suffering, to call for humanitarian aid and workers to be allowed in, and to call for the fighting to stop.’ On the contrary, the message they delivered was that the fighting had to stop, and Miliband, contrary to the position of the Co-Chairs on Sri Lanka, who had asked the Tigers to surrender, dodged the question put to him by the BBC in that regard. Miliband’s culpable ignorance is apparent even in the latest article he has co-authored, if that is the right word, with Kouchner, who once again seems to have been taken along for the (or a) ride. He talks about ‘refugee camps that had been created to house Tamil refugees from Jaffna’, forgetting that Jaffna had been in government hands for years, and the camps were for the civilians from the Wanni, which the Tigers had previously controlled, who had been forced to accompany the Tigers in their retreat, to act as human shields. The article declares that there was ‘Random shelling in areas of fighting — including after the government had announced an end to fighting’ which is nonsense because the fighting continued to the middle of May. The further claim that they saw ‘Tamil life treated as fourth or fifth class’ is nonsense, as those who were rescued from the Tigers have testified, and as the UN has acknowledged in noting how the government managed to avoid the humanitarian catastrophe that so many doomsayers were confidently predicting. Amongst these were the two senior British diplomats in Sri Lanka, both handpicked as having served previously in David Miliband’s private office. And while the Deputy was at least human, his boss was described by a colleague as a total yes-man. His lack of social skills made him quite unfit to represent his country, and it seems that he was only made an ambassador because of his unquestioning loyalty to his Minister. Miliband’s total lack of attention to fact is apparent when he talks about the UN Secretary General visiting Sri Lanka in March 2009, when the visit was in May, after the war ended, well after Miliband’s April visit. He claims then that Ban Ki-moon ‘wrenched from President Rajapaksa a commitment to independent investigation of alleged human rights abuses’ which is a total mis representation of what was said in the joint statement. Miliband assumes the rest of the world does not understand such principles. But he also forgets that, when he visited, there was no peace, and he tried to prevent peace by giving the Tigers a new lease of life. Miiband again talks nonsense in relying for his next arguments on the panel of Experts that Ban Ki-moon set up to advise him on accountability issues. He claims that ‘tens of thousands of people lost their lives in the space of three months at the beginning of 2009’ which again ignores facts since, at the time Miliband visited at the end of April, the worst case possibility, which the UN declared was not reliable, was around 7,000 altogether. But Miliband’s determination to persecute Sri Lanka was apparent from the moment after we defeated terrorism. He instigated a Special Session of the UN Human Rights Council in Geneva, which he admitted in the House of Commons was intended to charge us with War Crimes. This put the kibosh on the efforts of his diplomatic sidekick in Colombo, who claimed that the session was intended to ensure that we treated the displaced well and resettled them quickly. There was no peep of acknowledgment however that their initial gloomy prognostications had been wrong, though we have now resettled almost all the 300,000 displaced, with full access to services such as education and health. Miliband however continues to preach, asking whether the government will ‘recognize that the continued failure to resettle Tamils in an equitable way, and give them economic opportunities as well as social rights, is a dangerous cancer at the heart of Sri Lanka’s future?’ He obviously has not bothered to look at what is happening in Sri Lanka now, and the massive developments in infrastructure and educational opportunities in the area. We can certainly do better, but to talk of ‘continued failure’ is nonsense, and it is a pity that he does not read the reports of those on the ground with regard to progress. Finally, when David Miliband, who was fully complicit in the attack on Iraq, claims that a failure to put Sri Lanka in the dock might ‘only fuel the arguments of those who want to take the law into their own hands’, one realizes he is talking from experience. Such efforts at justifying neo-colonial excesses should be recognized for the hypocrisy they are. But more seriously, such relentless hostility to a government that has got rid of terrorism from its shores suggests an even more insidious agenda – continuing turmoil for countries in which grand panjandrums like David Miliband can interfere at will.